Looks like Sierra Leone is looking at working to improve their internet connection in the semi-near future. Check out an article on Global Post about it. This would be great news for programs like ours! If we thought the first 48 hours were crazy, we had no idea what the next three weeks would be like. 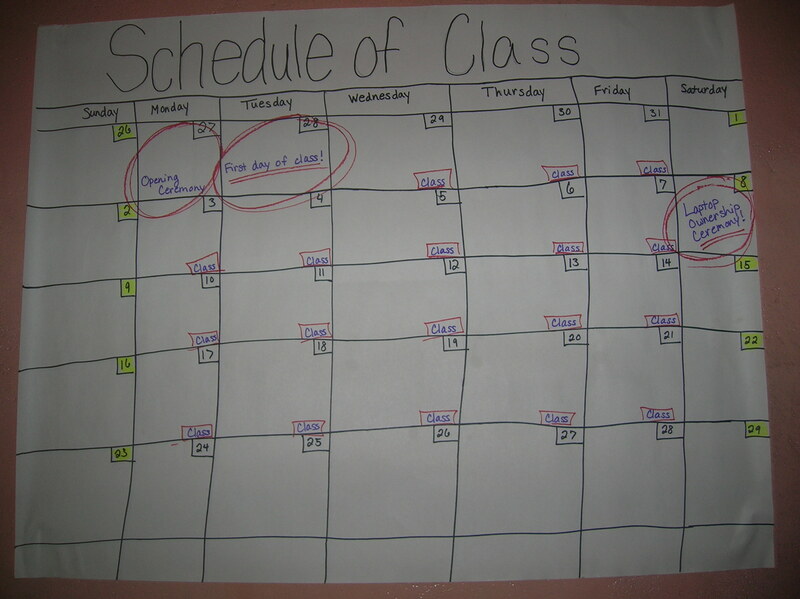 Because of the delay in receiving our laptops, we crunched what we’d planned to do in 6-7 weeks into 3 weeks. And, these three weeks included Jamie leaving in the beginning of the first (we’re very happy he was able to see the computers with kids and help with the first day :)) and Katie R leaving in the middle of the third week. At the time, we had no time to sleep, let alone post blog entries. While we planned to update the blog after arriving back in the US, as usual, life continued and we weren’t able to update it as quickly as we’d hoped. So, just in case, any of you were wondering, here’s a look at what our final three weeks looked like. After the chaos of the past 48 hours, the time-crunched nature of our project continued with the first day with all of the kids. On Monday, Chelsea and I got to DCI at 6:30 am to finish checking and updating all the computers. We organized our materials, set up benches and chairs outside for the parents and kids, and prepped for the arrival of 95 kids with their parents. Luckily, we had tons of help, especially from some of the kids and awesome volunteers. Katie R, Jamie, and Banie joined us after appearing as special guests on a local radio station. With more than a little apprehension, we greeted parents and families as they came in, checking in students and confirming their ages. 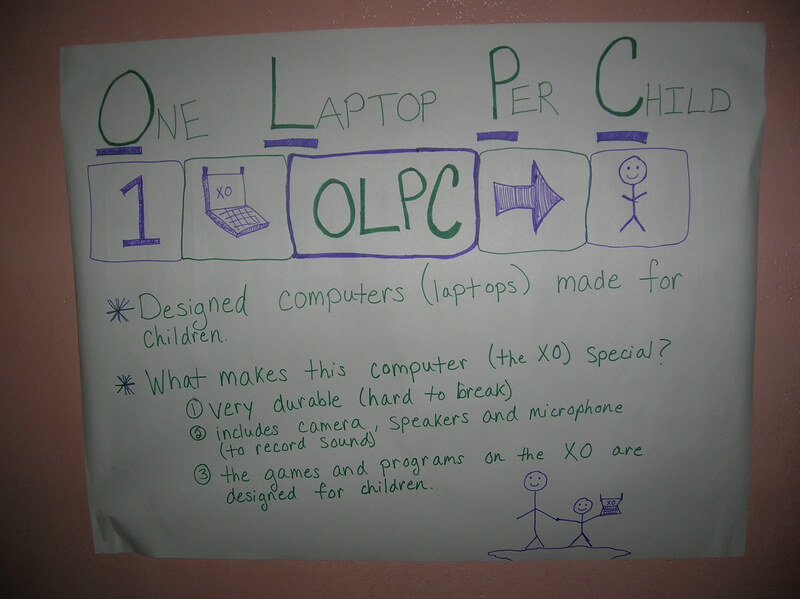 There was some confusion when some kids tried to get computers who were not on our list. We did our best to allay the confusion and to help as many kids as we could. Below are some pictures of the check-in process. After checking in, parents and students headed outside to learn more about the program and class. Banie and Satta did an excellent job explaining, discussing the program, children’s safety, and the importance of child ownership, and Solomon showed off the computer and its functions. It was very exciting for us to see the DCI staff and volunteers in action. We continued by distributing the laptops, having each child write his/her name of his/her XO, and asking the parents to sign their child up for a class session. We ended the session around 11am, already thoroughly exhausted. The day continued with preparations for our first day of classes, finishing our computer updates AND (drum role please) establishing internet! Thank you Zain! Katie R, Chelsea, Jamie and I headed back to the Pastoral Centre in the late afternoon, completely exhausted but very happy with the day. Hi All! We are working on updating the blog post receiving the laptops, but for the time being, please see the Tulane New Wave article about our project. After a month and a half of contemplating the futility of our roles in this program, at the brink of utter frustration and despair caused by our apparent customs-and-internet-problem-solving impotence (see XO’s Please Continued)… something happened. Things started moving, things started going right. 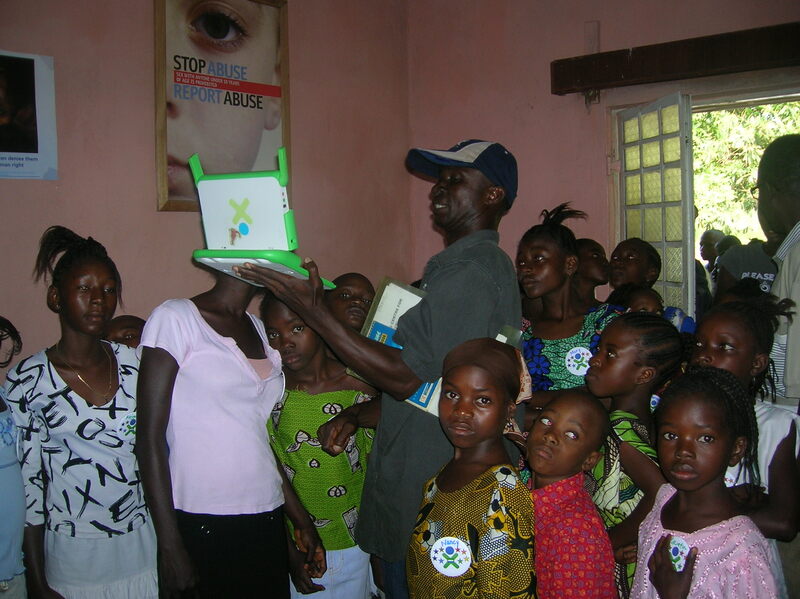 On Sunday, July 26th at around 1:30 in the afternoon (start clock- 0hrs 00min), our shipment of brand new, bright green XO laptop computers finally, finally, FINALLY arrived at Defence for Children International’s Kenema office. Well, 99% of them arrived, but that is enough for us to start the program, anyway. We worked all afternoon to get them unpacked, numbered on the side with a Sharpie, serial numbers recorded, and NANDBlasted (software updated). NANDBlasting went pretty well, although the copies that we made of the USB stick that Reuben gave us in Kigali did not work for whatever reason, so we made due with just the one original stick. Though we had enough work to keep us at the DCI office until late into that night, a prior engagement brought us back to the Pastoral Center (our home away from home) on Sunday evening (clock- 3hrs 19min). We had planned a big, huge birthday party for all the kids that live nearby and their families, to celebrate all of the birthdays that will happen in the next year when we’re not around. We first met this group of kids around the Pastoral Center last summer, and they have proved to be not only great friends who kept tenaciously in touch with us over the past year, but also “cultural brokers” to help guide us as we stumble awkwardly through the inevitable cultural mishaps of international travel. They are a wonderful group, curious and so smart, aged from 2 to 20. Meeting them was one of my favorite things about coming to Sierra Leone last year, and the eagerness and potential I saw in their bright eyes was certainly one of the main inspirations in applying for the OLPCorps grant in the first place. Having the birthday party on Sunday seemed like a good idea when we thought the laptops were going to be there Saturday, but both events on the same day was, well, hectic to say the least. The party was certainly a success, though it started out a bit awkward with the parents and then almost turned into a riot at the end. The party really got started with a dance competition (which was awesome), judged by the parents and separated by the youngest, middle, and oldest kids- we have some great video of that. Next, we all went out to whack at (or flog, as the kids say) the piñata that Jamie and Chelsea had constructed out of palm fronds, cardboard, duct tape, stickers, and colorful plastic bags… which turned into an absolute, fist-throwing riot when the candy finally spilled. It was actually kind of terrifying, and I was afraid that some kid was going to get trampled or smothered to death, or at the very least that the parents would all yell at us for endangering their children’s lives… but everyone survived and they actually all seemed to love the whole piñata ordeal. We finished off the evening (clock- 7hrs 51min) with a veritable birthday cake, icing and sprinkles and all (it was even baked, Emily). Bright and early on Monday morning, Jamie, Banie and I took a trip up Freedom Mountain to Eastern Radio 101.9 Kenema, the voice of justice and development (clock- 17hrs 07min). We were the live guests on the hour-long morning show, which focused mainly on the long-awaited commencement of our project, telling the entire Eastern Region the benefits of these laptops for kids, and answering questions from callers. Then we signed autographs for all the fans that lined up outside the radio studio after the show… ah, just kidding- we’re not that cool yet. It was a pretty fun way to publicize, and the radio show host and callers had some great questions. Check out an audio clip of the program below (sound quality isn’t too great, we’ll try and improve it when we can)… ok nevermind, internet connection is a bit slow. Simultaneously, as the radio waves soared invisibly through town, Katie M and Chelsea headed off to the DCI office to set up for the first real day of the program- meeting with the parents and assigning computers. We had all the kids (95!) and all their parents come to the office for a presentation on the class and responsibilities of the parents (clock- 18hrs 30min). We had the kids sign up for class times, and then we handed out the computers (95!!) so that kids could put their names on them and decorate them with the formidable leftover sticker collection of Katie M’s childhood. We’re keeping 5 of the computers as spares, and our own computers will go to the class teachers. It was a bit chaotic at first- there were plenty of children who were not on DCI’s list who appeared and asked for computers. 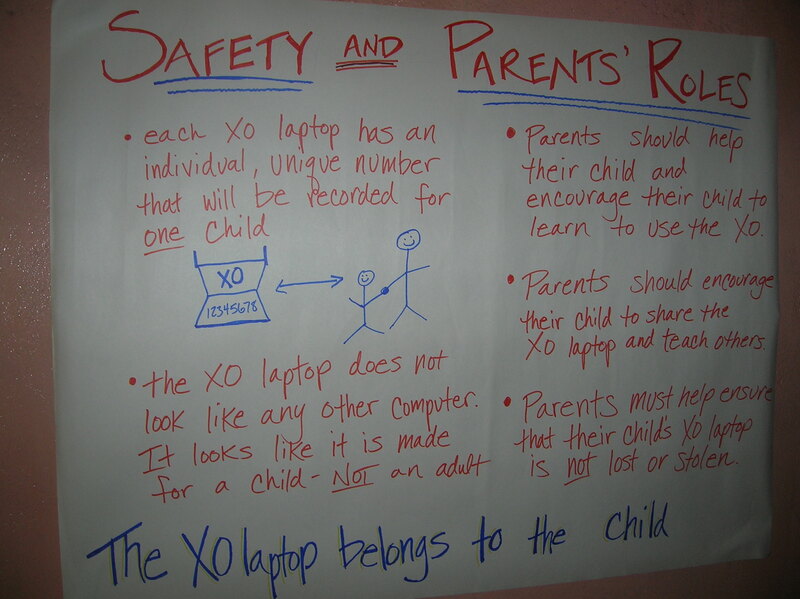 For those who were on the list, when it came time to hand out the XOs, the message that we have a computer for each child on the list, it’s not first come first served, was drowned by the clamoring mass (kids and parents) that pushed, shoved, and scrambled to get their computers before the others. Overall though, parents were receptive and eager, kids were thrilled, the entire region was notified, and the program was finally launched. All by 11 am last Monday morning (clock- 22hrs 30min). As if this wasn’t enough for one 24 hour period, Monday afternoon brought another advance in the battle against powerlessness. We FINALLY got a successful internet connection at the DCI office- not a wireless one (yet! ), but a genuine, real-life internet connection. We had been working on this for the past month, as well, battling/getting the run-around from one piece-of-crap communications company who sold us a modem and service for a modem that just does NOT work in Kenema (it works in Freetown, yes. Kenema, no- they just don’t get it). If any of you faithful readers are in the market for a modem that functions outside of Freetown, or at the very least a communications company that has any idea how to operate the products that it sells, I would not recommend SierraTel. The previous week, with the finality of a very strongly worded letter delivered to the heads of the main office in Freetown, we had finally given up on SierraTel, resigned to the fact that we would probably just have to eat the money and time we wasted on their modem. However, inspired by the working internet on our trip to Sahn Malen and not giving up on the idea of internet yet, we had another communications company, Zain, come out to the DCI office on Monday afternoon to set up their modem… and it worked. Almost instantly. It was amazing. We checked email right there (clock- 26hrs 11min). Tuesday the actual class started with the kids (more on that soon), though I didn’t get to see it because Jamie and I caught the early bus to Freetown (clock- 38hrs 13min) to drop him off for his flight home. Not ones to waste a trip to Freetown, we walked straight from the bus station in Freetown to SierraTel with our worthless, poor excuse for a modem and copies of both our receipt and our strongly-worded letter to demand, even though it was probably hopeless, a full refund. And it worked. Almost instantly. It was amazing. (Clock stop- 48hrs 00min). Whew! These 48 hours brought about the conclusion- in our favor- to several of the battles we’re been fighting since we arrived here. Jamie back to the U.S. The rest of the week was still busy, but in a controlled, manageable way. Faaez, from the other OLPCorps team in Sierra Leone, came to the rescue on Thursday like a wireless internet super hero, tights and all. Thanks to his magic touch and the sweet Linux nothings he whispered to our server’s ear, we are now broadcasting the signal of our functioning Zain modem through the server and the wireless access points. We have the first wireless internet spot in all of Kenema and probably the whole Eastern region. The first week of class was great. We’re still trying with our teachers to find the right balance between instruction and constructionism, but the kids are so smart and so eager, they learn so fast. We have uploaded several pictures form the first week on our Flickr page that I would highly recommend. In an attempt to catch our faithful readers up with our continually chaotic lives post-XOs, here is a blog about our life pre-XOs. You know when you are waiting for an important call – a call from the doctor, or from a job interview, or from Cox Communications – and you have been waiting all day? And, after waiting hours next to the phone, you decide to run to the bathroom because you have been waiting all day next to the phone. And, just when you sit down on the toilet, the phone rings. That’s what our trip to Sahn Malen was like. As you know, we had been waiting weeks for customs to release our laptops. Being incredibly bored and not having anything else to do until our laptops arrived, we decided it was the perfect time to go visit the other SL OLPC team. 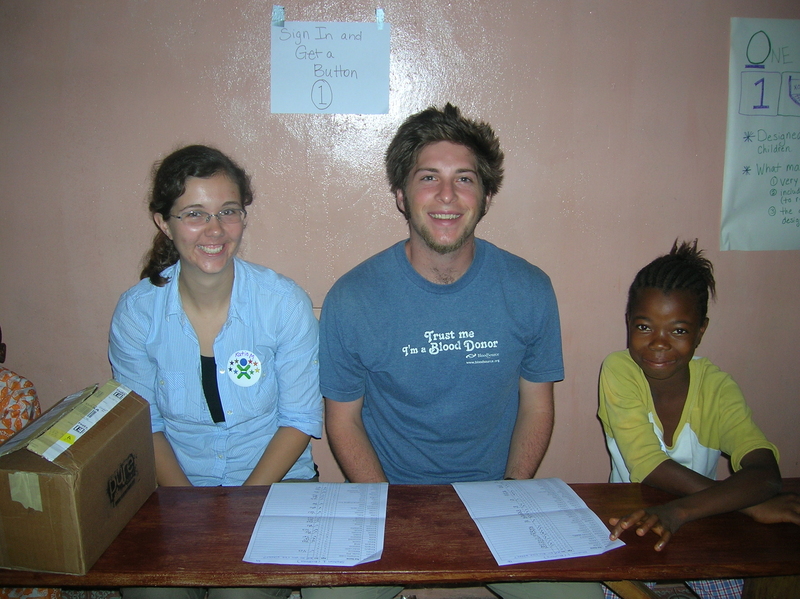 Katie and I met two of their teammates when we were in Rwanda and they were pretty awesome. Although the morning started out with bad luck for me (freezing cold showers with no electricity and the water running out do not bode well for the start of the trip), the trip was uneventful. Upon leaving Kenema, we first took a taxi to Bo (the 4 of us with 6 of our closest friends – we were in a 5 passenger car – about an hour away). Once in Bo, we found another taxi to take us to Pujehun town. The road to Pujehun is about 30 miles paved and 12 miles unpaved – about 2 hours. We shared the taxi with our closest 9 friends (again, 5 passenger). When we arrived in Pujehun, we found that most of the motor bikers had been arrested the day before because they did not have licenses. We had planned on taking a motor bike to Sahn Malen… we finally found two bikers and ended up riding 3 to a bike with several backpacks. I’m still sore from trying to hold onto the bike with my legs and trying to keep my back straight (and not fall off the bike) with my stomach muscles. Excellent workout! It took us about 30 minutes by bike to get to Sahn Malen. The Hondas knew exactly where to take us because our friends were the only poo-mwis there. 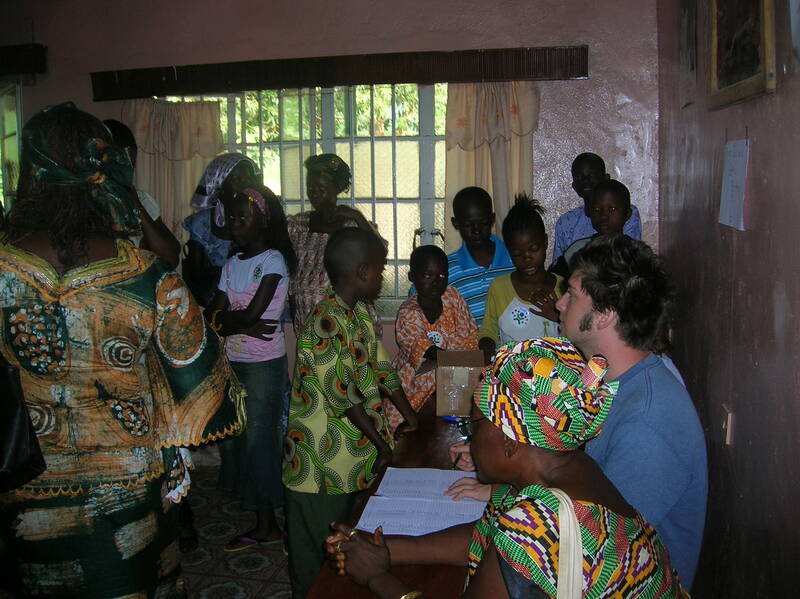 In fact, people in Bo even knew who we were going to visit (one of the Sahn Malen team members has dread locks, an unusual hairstyle for men in Sierra Leone, so they know who he is). The village, Sahn Malen, is really rural and the team has one of the few generators in town. They get many of their supplies from Bo (which is 2-4 hours away, depending on the type of transportation). We got there in the mid-afternoon and went to see the other team’s set-up (very low tech but good). They power the laptops with the combination of a generator, individual solar panels, and a battery (powered by solar panels). They were building off of a previous deployment in December, working with peer educators and two local schools to provide XOs to all children in Class 5 (roughly, fifth grade). After observing their setup, we headed out to a “nearby” village (1 hour’s walk away) with another team member who was following up on mosquito net distribution project. On our walk, however, Chelsea kept getting flashed on her cell phone by two of our DCI colleagues. (BTW, the term “flashing” refers to when people call your cell phone quickly, so you know they called, but not so you have enough time to actually pick up the phone. Because most people pay for their cell phones by the minute, calling people, especially when they have a different provider, can be expensive.) They kept calling but, of course, we had no signal because we’re in the middle of nowhere – literally. We were between two extremely isolated villages. We finally found a place where there were two bars but we had no units. So, we flashed them back. See the pictures below for a visual representation of how the call went. Do we have laptops? Thumbs up? Thumbs down? Yay!! We got our laptops!! Luckily our DCI friends called back to tell us our laptops had been freed from customs! Unfortunately, DHL was saying they couldn’t bring them to Kenema. 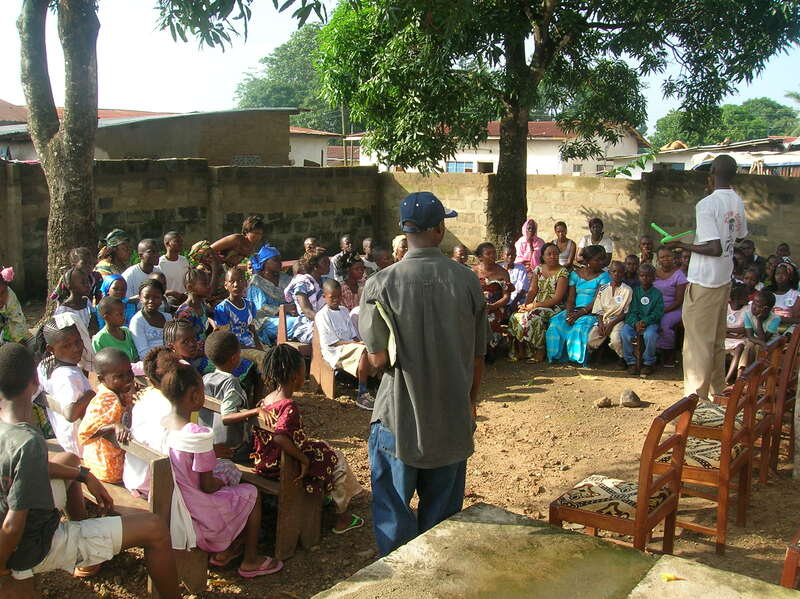 (This was after we were assured by two reps in Freetown and 3 reps from the international office that they would be brought to Kenema.) After frantically returning to Sahn Malen, buying units and finding the best spot to make calls (stradling a gutter, interestingly enough), we called the OLPC rep in Boston and Emily, our amazing team member in Buffalo. We left a voice message for the OLPC rep (I think, a barely coherent message) and talked to Emily, who kept calling us back on Skype when we lost signal. I sat in a crouching position for about 15 minutes and in the middle of a puddle while we spoke. Then we called the DHL Freetown rep, who told us he would call back once he figured out the additional fee to transport the laptops toKenema (because they hadn’t figured that out before… ?). We thought they were trying to get more money out of us, but it turns out not to be so. Or at least, the charges were somewhat legit. Back to Sahn Malen – we spent the rest of the evening eating pineapple and coconut, hanging out with Carlos and Faaez, meeting their team, setting up internet, and seeing what we later determined was a bush baby (thank you Wikipedia). We stayed the night in Sahn Malen and departed early in the morning to head back to Kenema and get our laptops. 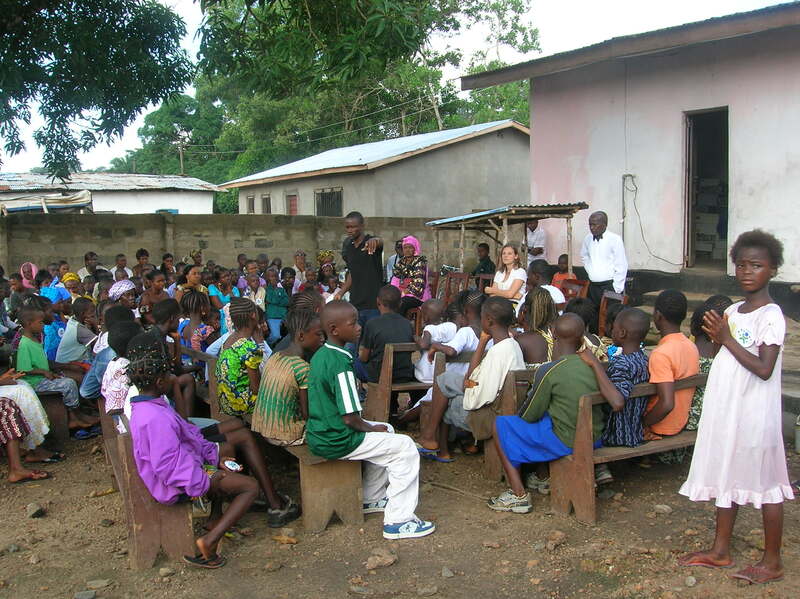 We spent less than 24 hours in Sahn Malen, and it was the first day we had all been out of Kenema since we arrived. Too bad we didn’t leave earlier – we may have received our laptops earlier! We received our laptops today! Well, 99% of them anyway… we were missing one. More updates about that later. Do we have your attention International DHL PR staff person? We certainly hope so. Our laptops were freed from Customs on Wednesday (to our great relef and joy). However, another struggle has presented itself. Despite repeated assurances from the DHL Sierra Leone office that we would be receiving the laptops by Friday, at the latest Saturday at 1 pm, we are now sitting here at 6:40 pm posting this blog with nary an XO in sight. DHL SL did not deliver on the day that they assured us (several times) that they would deliver. This will delay the start date of our program once again, to the disappointment of 100 of the most vulnerable children in Kenema. DHL claimed that our shipment was delayed because it rained yesterday. This is absurd. It’s the rainy season. DHL SL is using a commercial bus to send our valuable shipment unaccompanied across the country, instead of using secure DHL vehicles. Not only did DHL SL use alternate transport for our shipment, upon our calls to DHL SL agents this morning, they were completely unaware of the shipment’s status or location. DHL SL gave several conflicting reasons why our shipment did not come as promised. First, they cannot deliver in the rain. Second, the vans had technical problems. Third, the van was full. If there was a problem with our shipment the night before, we should have been notified immediately. We look forward to Sunday where we will either be presented with our laptops (as most recently promised) or with ever more creative excuses. We welcome a response from any DHL staff who should happen across this post.